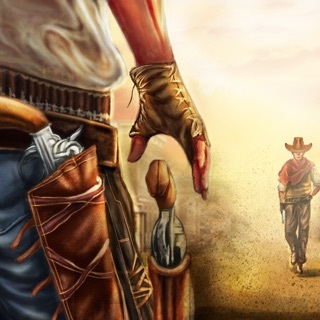 The townspeople are looking for a deadly Bounty Hunter to rise up and eradicate the Wild West’s most heinous scum! They’re looking for YOU! Collect bounties. Earn prestige. Be quick on the draw and you’ll win the day; too slow and they’ll be measuring you for a pine box. Dead or alive, how you bring in your target is up to you. •	Skill-based gameplay! Anyone can be fast, but it’s accuracy that counts. •	Lush, realistic environments and 3-D rendered characters. •	Historic weapons! Un-holster your trusty revolver or dust off that double barrel shotgun. 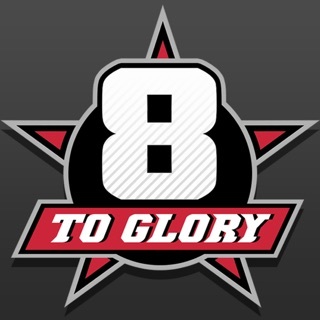 •	Upgrade and customize your gameplay. •	Enjoy an immersive sound track and realistic weather effects. Don’t forget to throw on that bandana to keep the sand out of your mouth. The wind blows through the streets, kicking up dust. It's high noon when you walk into the street, your six shooter at your hip. A man walks into the street in front of you his pistol at his side. There is a bounty on his head, and you took the contract, and you aim to collect. 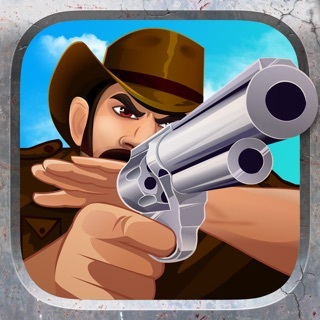 Welcome to Bounty Hunt one of newer Wild West games to be found in the Apple App store. 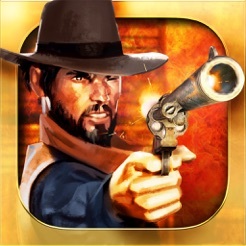 Why play other cowboy games when you can play this visually impressive western duel game? There are realistic weather effects, with rain, lightning, even wind that blows dust around, making for poor visibility. Your six shooter rises and falls with each breath as you wait for the call to draw. 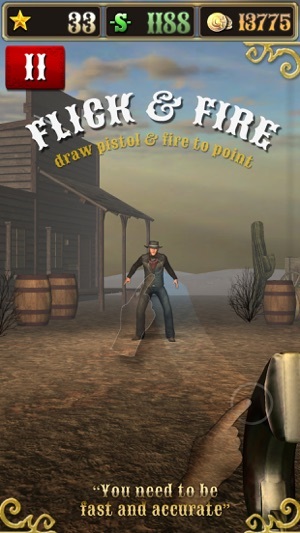 This game puts you into the dusty boots of a contract killer in the Old West, hunting down outlaws and bringing them in, dead or alive. The tutorial is quick and easy, and you can learn the game in minutes. The Flick Fire system is not complicated to use, and can be learned quickly. Mastering the game is another matter, and will take a lifetime. 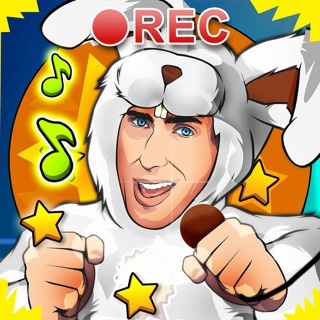 You need fast reflexes and skill, because this game is challenging! After you finish the tutorial, head to the practice range and shoot at some bottles lined up on a fence and work on your accuracy. The bottles aren't carrying 6 guns, so you're safer practicing on something that won't shoot back. When you feel ready, grab your revolver and try your skills in a duel. Be warned! The outlaws not only return fire, they are also quick draws. You'll be lucky to escape a duel with your life. Each time you win a duel; you collect a bounty and gain prestige. 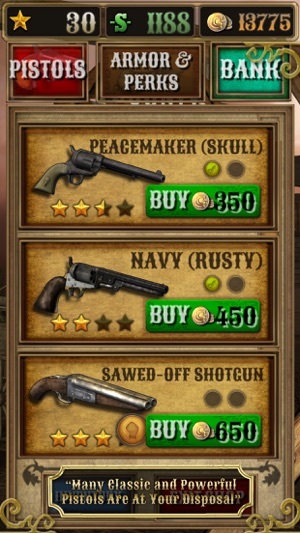 You can trade these at the shop for better weapons, better armor, or even a better hat. Different guns have different attributes, so you should take each one to the practice range to familiarize yourself with it before facing another outlaw. You can also use your money and prestige to upgrade your weapons and get accessories and perks, like the double holster that lets you carry and fire two guns. After you've done a few duels, head to the story map, where you follow the trail of a series of wanted men, complete with realistic looking Wanted posters. 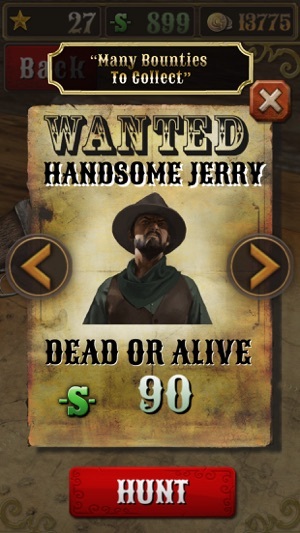 You'll need to pay attention here, because the posters not only tell you how much each outlaw is worth, but also if you need to bring them in dead or alive. If they need to be alive, you need to be not only a quick draw but an accurate one, making sure your shots are non-lethal. Bounty Hunt also lets you play with friends over a local area network (LAN). Wi-Fi is required. 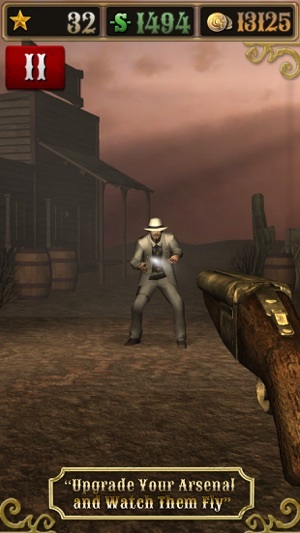 You may have seen western games before, but you haven't seen anything like Bounty Hunt. Download it today! The game is well crafted and features many excellent firearms, and even some throwing melee weapons! The weapon use system is very easy and fun to use, and this game would get a five star if it weren’t for ONE problem. On occasion, you adversary will get in a stance I like to call “the god stance.” In which your opponent has an instantaneous and deadly draw with perfect aim. This can be recognized by their beginning stance. If it is like the movies, both hands at sides, squatting down, then it is a fair and beatable fight. But if they rest their hand on their holster, then they will, on “fire” draw instantly and, it IS possible to defeat them, but not without dying in the process. But other than that, great game, cool weapons, excellent gameplay mechanics, I would recommend this game if you like to do awesome cowboy-style duels. I would also like to recommend that the developer fixes that unbeatable stance. Let me get this clear: The theme and the mechanics of the game are great. It’s freaking fun to gun down three guys in the blink of an eye without getting the cops called on you. Now, with that said, on to the problems. 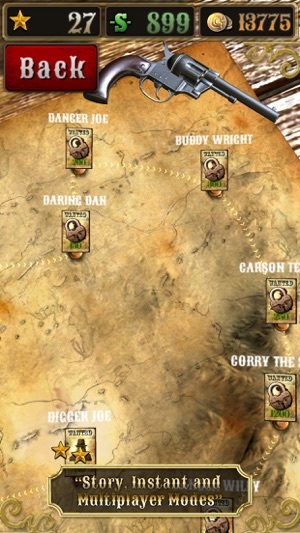 The first issue, and this might just be mine, is that whenever I exit the app and re-enter, my bounty map progress is reset to Muddy Jack, when I had already beat Dave. Another issue is the quickdraw stance. When your opponent starts with one hand on his gun and his shoulder back, you have an almost zero chance to win the fight. Even if you do land a hit, it won’t be before you’re fatally shot. It’s nearly game-breaking and you have to exit as soon as you see it, lest you be shot down. Other than that, it’s a great time passer that I recommend.